The Alfa Romeo Milano was the last car fully developed before Fiat's takeover of the company from the Italian govt in 1986. Milano sedans are known for their bizarre non symmetrical styling cues. The Milano was the final iteration of the Alfa type 116 transaxle cars (last weeks Alfetta turbo). They sell for pennies on the dollar compared to BMW E30's these days which is all the more reason to talk about them here. Speaking of BMW, the Alfa Busso V6 and the M20 straight six both share the less than desirable 30k timing belt change intervals. Today's car is not concours condition, but does have a unique flared body kit that would be near impossible to replace in any fender bender. 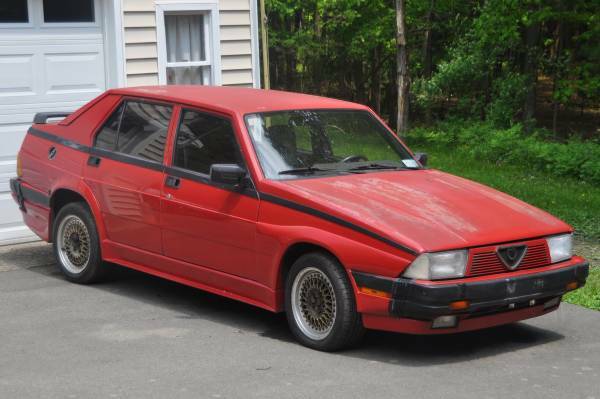 Find this 1987 Alfa Romeo Milano for sale in Newfield, NY for $2,300 via craigslist. 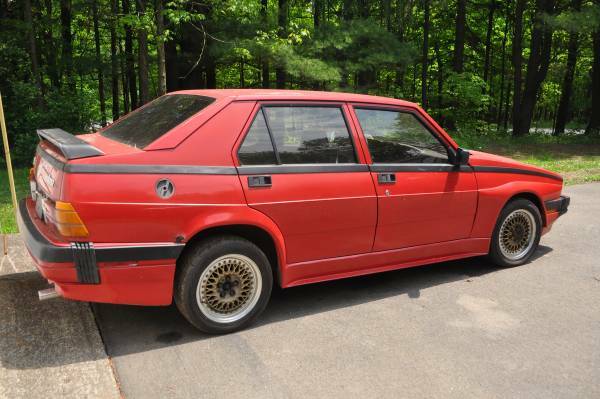 For Sale: 1987 Alfa Romeo Milano Gold with just under 58k miles. 2.5 liter V6 Busso engine runs strong and sounds amazing. Rear wheel drive, 5 speed manual transmission mounted in the rear for a near-perfect 50/50 front-to-rear weight balance. This is a rare and very fun car to drive with an incredibly addictive Italian V6 exhaust note. Car is registered, inspected, and able to be driven. I have a clean NYS title in hand. It's a little rough around the edges and the paint leaves something to be desired, but it runs and drives and is a super fun summer beater/project car. - Dunlop Direzza DZ102 tires with very few miles. - New coolant hoses with recent coolant flush. - Many other new parts and recent maintenance - fuel lines, brake speed bleeders, etc. - Minor body rust spots in a few corners. The underside of the car is otherwise pretty clean. - No working stereo. Heater controls are not operational, either. 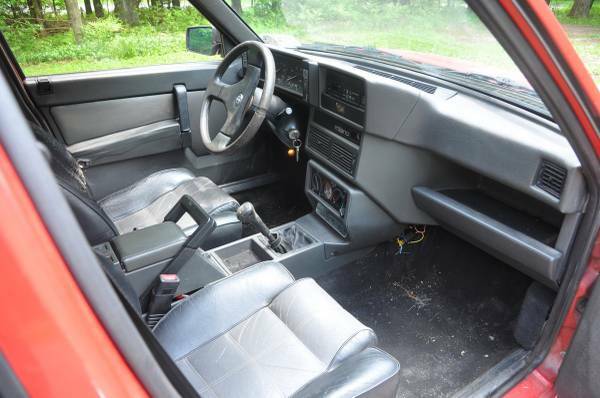 Things get really weird from a ergonomic point of view on the interior of these cars. The space ship style hand brake is a cool feature. However, the window controls located on the top of the overhead console and low mounted radio that can get blocked by the shifter being in 5th gear are puzzling or quirky depending on your mood. A number of years ago, I owed a 88 Milano Verde that one day started smoking out the center vents at a stop light. I was never 100% sure of the cause, but think some leaves may have gotten in the blower motor. Cory is making a road trip to pick up a set of lightweight BBS 17" wheels for his 99 Mercedes E300. Ugh, such a great deal and so far away. 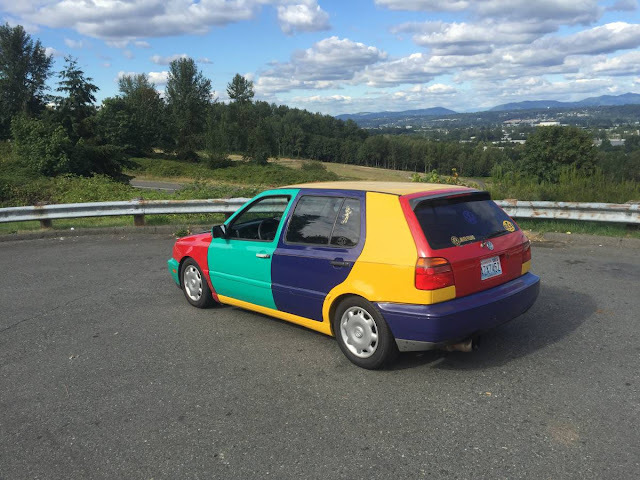 Remember the tri-colour hood I wanted on this? Ahh, the Alfa Milano. Good memories. This kit seems to only be the front fenders, side skirts, and spoiler. The rear arches look pretty stock to me. You have no idea how crappy the parking brakes on most spaceships are. They might as well be marshmallows floating around in hot chocolat for all the good the parking brakes do. Worse than a Zeppelin in March. Like gripping a knife covered in hot butter. It’s not like you can turn the wheels into the curb either. It’s a slip ‘n slide s&!t show I’m telling you! Hugh will be here all week, folks. He gets no respect, I tell ya. How about converting this to electric? Reminds me of the Wheeler Dealers where Ed China converted a Maserati biturbo to electric.